The Devil is a Woman (1935) was the seventh and final film of the legendary screen collaboration between director Josef von Sternberg and his alluring star Marlene Dietrich. Like the greatest of those earlier films, The Blue Angel (1930), Morocco (1930), The Shanghai Express (1932), and Blonde Venus (1932), this film’s focus was entirely on how love can overpower a reasonable person’s mind and compel him or her to submit completely to its demands. And while all those earlier films pushed the limits of believability concerning what love can do, in some respects The Devil is a Woman went the furthest in this direction. Romantic films typically have two narrative streams – a dramatic outer narrative that involves goals and threats in the external world and an inner, relationship-oriented narrative involving the main characters. However, in the case of this film, the relationship narrative is pretty much everything. The Devil is a Woman was scripted by John Dos Passos and was based on the French novel La Femme et le Pantin (The Woman and the Puppet, 1898) by Pierre Louys. That novel also served as the basis of several other films, including La Femme et le Pantin (1959) directed by Julien Duvivier and starring Brigitte Bardot, and That Obscure Object of Desire (1977) directed by Luis Buñuel; but those films are all different in style and substance. 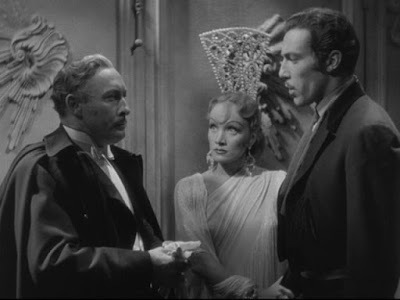 Interestingly and uniquely in the case of The Devil is a Woman, the two main characters appear to have been specifically sculpted to correspond to the real personalities of von Sternberg and Dietrich, whose offscreen relationship was the subject of much speculation and which I will briefly discuss further below. Although I have identified the relationship narrative as the dominant theme in this film, the most memorable aspects are not so much the specifics of the story but rather the expressionistic dreamworld that von Sternberg conjures up to tell it. As usual for a von Sternberg film, everything was shot in the studio, where von Sternberg had complete control of every last detail and where he could carefully set his lights to fashion scenes with the chiaroscuro that made the entire environment contribute to and reinforce the mood of the storytelling. 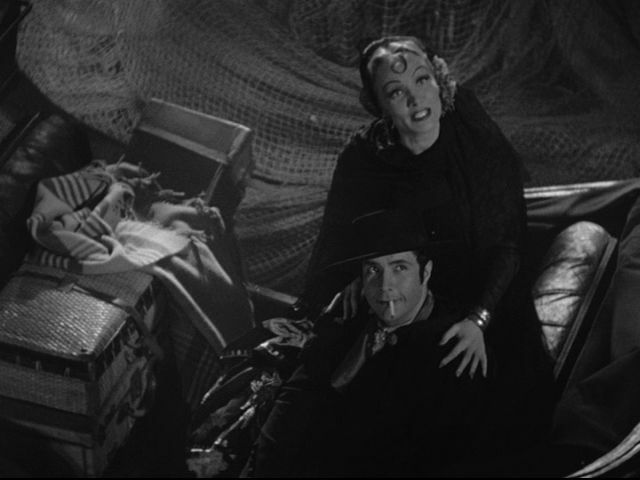 For von Sternberg the visual context of his action was so important to the storytelling that it was occasionally intentionally staged to obscure the activities of the principal characters under view. Von Sternberg’s dreamscape was further enhanced by the contextually-supportive musical score, which was adapted from Rimsky-Korsakov’s Spanish Caprice and some classic Spanish melodies, including one of my favorites, Enrique Granados's Danza Espanola, No. 5. A beautiful, passionate, and bewitching woman whose mind and future directions are ultimately unknowable. Marlene Dietrich played this role for von Sternberg during their time together, but there had been others, too, such as Evelyn Brent in Underworld (1927) and The Last Command (1928). A young, studly and prepossessing male who is used to having his way with women. This person is often thoughtlessly narcissistic but not malevolent. The beautiful woman usually finds him irresistible. An older more sensitive and reflective male who selflessly offers his love to the beautiful woman. This person is more introverted and less confident, but his personality and character are richer, and his amorous commitment is deeper than that of the competing lover. 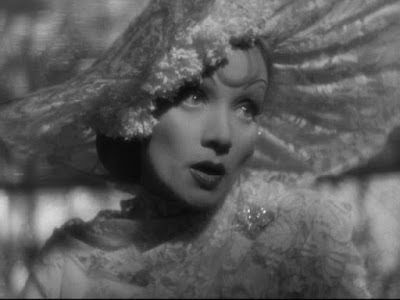 Concha Perez (played by Marlene Dietrich) is a beautiful and capricious young working woman. Antonio Galvan (Cesar Romero) is a young, handsome republican revolutionary who is on the run from the government police and is getting ready to flee to Paris. 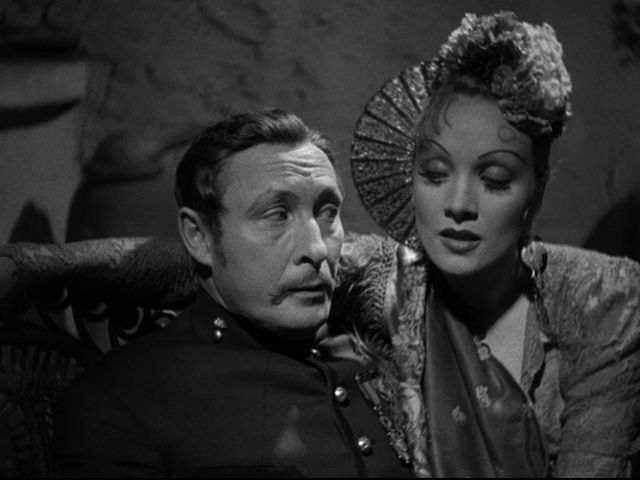 Captain Don Pasqual Costelar (Lionel Atwill) is an aristocratic officer in the Spanish military. He is the older and more refined figure of Sternbergian dramatics who has a mad infatuation with Concha. Governor Don Paquito (Edward Everett Horton) is the androgynous, yet ridiculously despotic, authoritarian commander of Sevilla who is trying to maintain order during a festival season. The film’s narrative is structured roughly into four sections, the second of which is a lengthy flashback period that takes up more than forty percent of the overall running time. At the film’s outset the viewer is plunged into the lavish spectacle of Sevilla’s Spanish Carnival festival, which is an extended celebratory fiesta just prior to the Roman Catholic Lent period. There are masked parades, masquerade balls, and continuous scenes of merriment, all of which is brilliantly evoked by von Sternberg’s expressionistic staging. Collectively, they remind me of the masked ball scene from von Sternberg’s Dishonored (1931), though these are perhaps even more flamboyant and colorful. During a parade Antonio Galvan, who we will soon learn is ducking the police, is masked like all the others and enjoying the festivities. He spots a beautiful woman, Concha, riding on a street float, and manages to catch her attention by making eyes at her. Concha is a coquette and runs away, but before disappearing she has a note passed to him that he can meet in the evening when she normally goes for a carriage drive down a particular street. 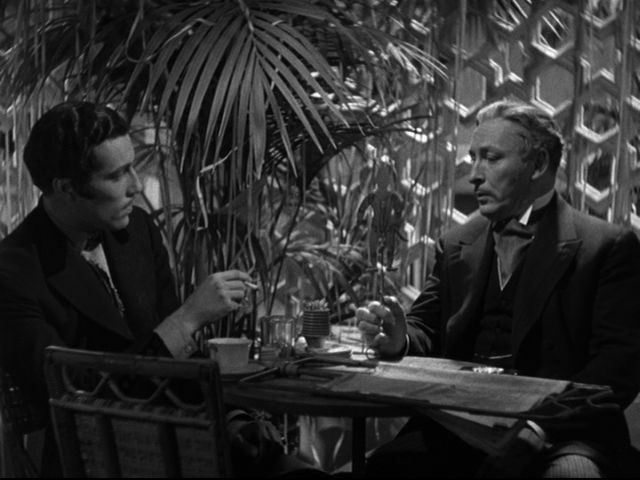 At a café, Galvan runs into an old friend, Don Pasqual, whom he hasn’t seen for years. When Pasqual is asked if he knows anything about Concha, he launches into a lengthy account of his unhappy experiences with the woman, whom he first met five years earlier. This story-within-the-story of how this woman played with his affections and tortured him has five episodes. In each of these episodes, Concha leads Pasqual on and then rejects him, leaving him in the lurch. Captain Pasqual first saw Concha on a train trip, during which the cheeky girl precipitated an onboard fight that Pasqual intervened to stop. He was attracted to the girl, but she indicated to him that she was not an easy pickup, and when the train stopped, she departed alone. Sometime later, while investigating a cigarette factory, Pasqual sees Concha working there and is again attracted. After giving her a valuable gold coin, she invites him to her home where she lives with her widowed mother. After the two women ply him for more money, Concha kisses him, but she resists his natural response. She tells him that she kissed him because she loved him – for a minute – but she will not let him kiss her without him loving her. She claims (probably correctly at this point) that she merely pleases him and amuses him, but he doesn’t love her. These remarks spotlight a key theme to the film – how deep is one’s love?. Anyway, shortly thereafter Concha and her mother disappeared from town. Three months later Concha appears again and seductively tells Pasqual that she can no longer live without seeing him. Again he is infatuated and immediately offers to marry her. But after accepting a considerable amount of his money, she disappears from his life again. Months later Pasqual is sent down the coast on assignment and encounters Concha singing in a rowdy nightclub. 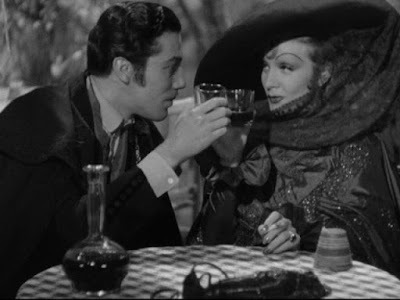 Of course, we expect to see a song from Marlene Dietrich at some point in this film, and she delivers with her naughty “Three Lovers” song, which probably accurately reflects Concha’s amoral attitude about romantic fidelity. The two fo them repair to her dressing room, where Pasqual again professes his desperate love for her, and she seems to respond. But it is soon apparent that Concha is also having an affair with a handsome young bullfighter, Moreno. When Pasqual breaks in on one of their trysts, he loses all control and gives her a beating (off-camera), thereby presumably ending their relationship. As we return momentarily to the “present”, Pasqual tells Galvan that this time he was really through with her. But the next day Concha comes to Pasqual and surprisingly tells him that she loves him. He pays out more of his money to buy her out of her nightclub contract, but immediately afterwards she abruptly departs on a week-long trip with the bullfighter Moreno. Pasqual is again humiliated. Pasqual tells Galvan that his affair with her became public, he was scandalized, and he had to resign from his commission. After Pasqual summarily points out that she ruined many men – indeed, the bullfighter she ran off with later killed himself because of her – he gets Galvan to swear he will not go near the demonic temptress. Pasqual and Galvan shake hands and depart, but Galvan still can’t resist going out that evening to meet Concha when she takes her carriage ride. He does so, and she soon brings him to a private room in a nightclub, where she listens to his accusations about ruining Pasqual. In the middle of this, however, she receives a hand-delivered letter from Pasqual declaring his undying love for her, which she reads aloud to Galvan. He is angry, but he cannot resist the temptation of her beauty, and he kisses her. The posturing between Pasqual and Galvan escalates, until Pasqual slaps Galvan in the face, symbolically inviting a duel. After agreeing to a formal duel to be held the next morning, Pasqual menacingly fires his pistol at distant target and demonstrates that he is a crack shot. With the sound of gunfire, everyone disperses in panic before the police arrive. Concha finds Galvan in his room and declares her love for him – she promises to run away with him to Paris. The next morning at a secret location in the woods, the duel is held. 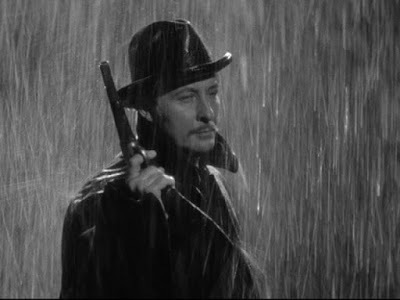 This is a brilliantly staged dark scene set during a pouring rain storm and evoking the utmost in expressionistic gloom. Concha, worried now about hew new love, Galvan, accuses Pasqual of trying to “kill the only man I’ve ever cared for.” The duel is then held, and Pasqual, surprisingly refusing to fire his pistol, is gunned down by Galvan. The police then show up and jail Galvan. Concha still has some cards to play, though. She goes to Governor Paquito and with her flirtatious charm seduces him into authorising Galvan’s release from jail and providing them with two fake passports so they can escape to Paris. She also goes to the hospital to see that Pasqual is still alive, barely. Pasqual, though at every turn he has been defeated, he is always honest: he tells her he didn’t shoot Galvan because of his total love for her. Concha and Galvan pack their bags, get through passport control, and get ready to board the train for Paris. At the last moment, though, Concha baulks and says she has changed her mind. She is going back to Pasqual. Your overall understanding and appreciation of The Devil is a Woman will probably depend on how you interpret that last action of Concha’s. Most people, it seems, view with a cynical eye Concha’s final refusal to get on the train with Galvan and return to Pasqual. From this perspective, Concha is seen as realizing her passion for Galvan is ephemeral and will soon run its course. She prefers not to give up her role as the puppet master, knowing that she has a helpless slave in “Pasqualito” that she can perpetually use and torment to her heart’s desires. People who hold this point of view see the film as a black comedy that scoffs at the hopeless naivete of the unrestrained human heart that often actively seeks its own ruin . But one could alternatively interpret Concha’s last action as a commitment to true love. According to this interpretation, she finally realizes that she has found a man who truly loves her (since he is willing to die and let her run away into another man’s arms). When she earlier accused Pasqual of only being dazzled by her charm, she was probably thinking of all the otoher men who were blinded by her glamour but didn’t truly love her as a person. Another point in support of this interpretation is that Pasqual at this point is a man whose career has been ruined. She is not returning to a privileged man, but to a man whose position is now considerably diminished. The prospects of treating such a man as a puppet would then not seem to be a major attraction for even a selfish flirt. So according to this second interpretation, Concha and Pasqual are united in true love in the end. Of course, some people might want to overlay their interpretation of the film with their understanding of the relationship between Dietrich and von Sternberg. 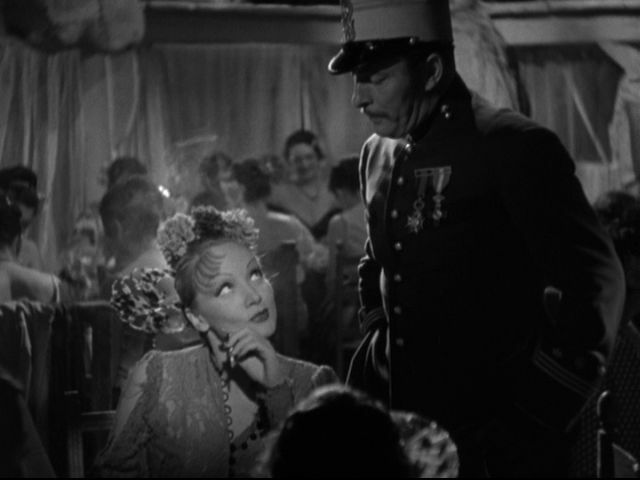 Certainly von Sternberg crafted Dietrich’s screen image and made her a star – their relationship has been variously compared to that of Svengali and Trilby and of Henry Higgins and Eliza Doolittle. However they got started, though, it is generally understood that had a love affair during their period together. 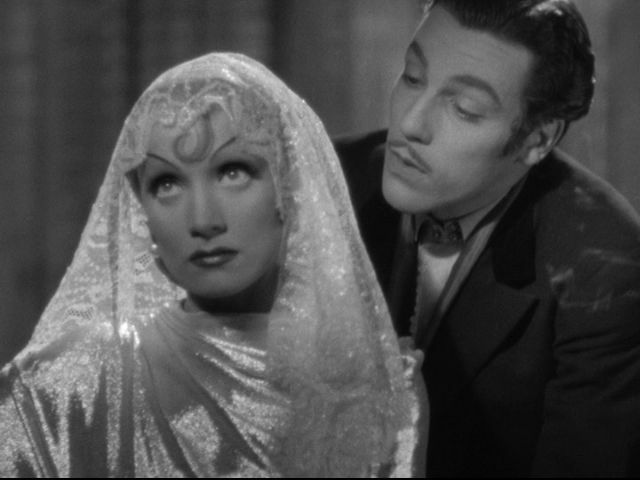 In addition the suggestion that Concha’s character matches well with Marlene Dietrich’s real-life persona is given support by Dietrich’s own comments that her role in this film was her all-time favourite . She was known to have been an amorous butterfly with an unending stream of brief love affairs with both sexes. 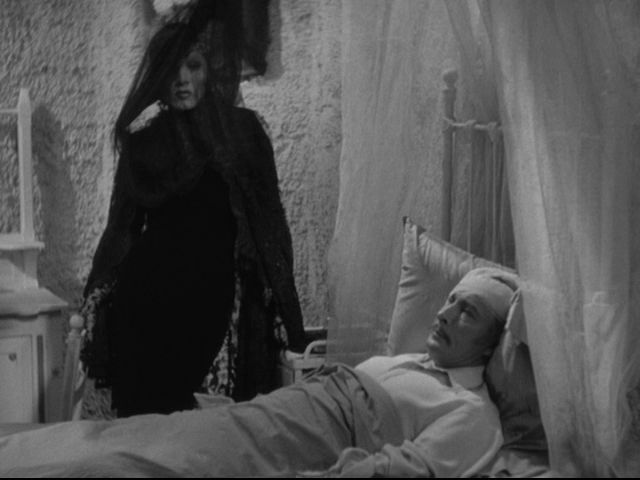 So in real life, Dietrich was perhaps just as capricious as Concha in this film. Although such speculation may be spicy, I think it is best to focus on the work as it stands by itself. Looking at just the film as it is, it is still a work of amazing splendour. Nevertheless, I perceive some weaknesses when comparing it to von Sternberg’s greatest films. Lionel Atwill’s performance as Pasqual is so reserved and militarily tight-lipped that we never get to see the two of them (Pasqual and Concha) interacting in a spontaneous and vital way. There is never any real electricity between the characters, and there relationship does not appear to evolve or progress. Marlene Dietrich’s behaviour is, virtually throughout, artificial. The passionate, emotive glances that she sometimes gave in other von Sternberg films are missing in this one. Her phoney unnaturalness here extends even to her heavy makeup, which featured extravagantly artificial eyebrows that were drawn inches above her physical brow ridge. As a consequence of this artificiality, she, never evinces even hints of any convincing, true ardour for anyone in this film. Perhaps, however, we should not really be looking for realism at all in this particular arena. This film, after all, is really von Sternberg’s grand harlequinade, in which the outlandish characterizations are another aspect of the moody, atmospheric spectacle. It is all part of an expressionistic masque under the control of the master marionettist, von Sternberg. So all my previous reservations notwithstanding, I go back to my appreciation for von Sternberg’s aesthetics. What he presents are all-consuming love stories. I don’t know about you, but I hold to the second of the two above interpretations of this film. Andre Sennwald, “The Devil Is a Woman (1935)”, The New York Times, (4 May 1935). Charles Silver, “Josef von Sternberg’s The Devil Is a Woman”, Inside/Out, Museum of Modern Art, New York, NY, (16 November 2010).